Welcome to the online profile of Ian Wakefield, always wanting to experiment with digital technology and social media I thought I'd bring all my online presences into one place. 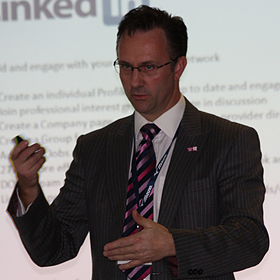 Ian Wakefield is a Chartered Marketer, Former Fellow of CIMSPA and a qualified Prince2 Practitioner. He was awarded a ‘Fellowship’ of the Chartered Institute for the Management of Sport and Physical Activity (CIMSPA) in 2006, and is in his 8th year as a 'Chartered Marketer' with the Chartered Institute of Marketing (CIM). A Competitive Cyclist he enjoys all sports, competing and spectating. Currently working in the Health sector. After years of researching my own Ancestry and doing the same for countless friends and colleagues, I've launched my own website. Marketing support developing resources to promote the golf legacy in Aberdeen. Responsible for all online presences for the Great Britain Basketball Team. Responsible for all Marketing and Communications for Sport Nottinghamshire, one of 49 County Sports Partnerships. Got CIMSPA's Social Media on the Map! Initiated a new fully interactive website and CRM system. I ran a successful CPD and Events program for 6 years. Successfully managed member services for 5000 members for 6 years. Cycling (Road and MTB), Genealogy (My own and other people), Music and International Travel although not all at the same time. Social Media.